Many victims of sexual assault are afraid of retaliation if they come forward. While retaliation can be hard to prove, it is a very real risk. 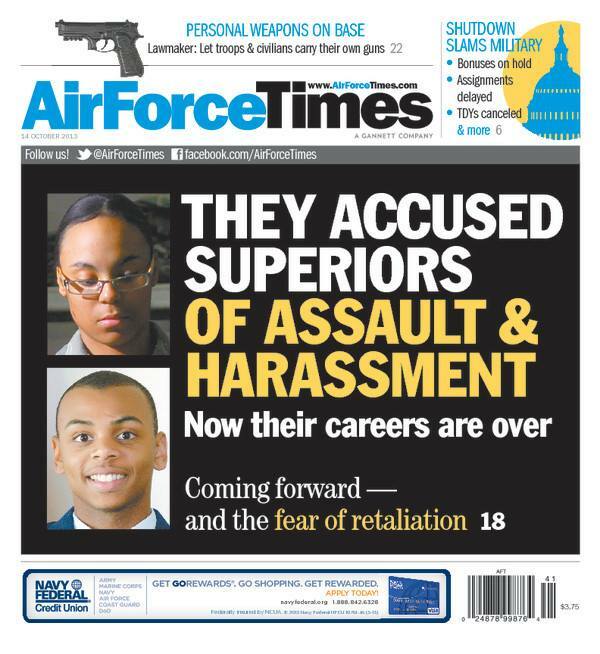 Air Force Times talked to three airmen who reported sexual assault and harassment and suffered the consequences. Also in this week’s edition: The partial shutdown of the federal government has hit the Air Force’s training and education programs. You can read which programs have been delayed and which have been stood down. The shutdown has promoted the Air Force to ground fighter squadrons for a second time in a year. The back-to-back stand downs mean it will take longer for combat squadrons to become combat capable, one analyst said. In other news, Air Mobility Command and the Defense Department disagree over how many C-130s the Air Force needs. But even if both sides agree on cutting the C-130 fleet, Congress will have the final say on the matter. And Air Force Times has started a new online Classifieds section to help airmen and families buy and sell items and services. Read the five things you need to know about the new section.